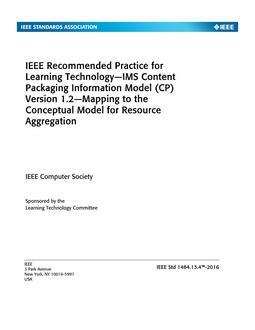 This recommended practice specifies how the elements and attributes defined in the IMS Content Packaging Information Model (CP) Version 1.2 relate to the components of the conceptual model for resource aggregation defined in IEEE Std 1484.13.1¿¿¿-2012. The mapping specified in this recommended practice may be used with the mappings of other resource aggregation formats to achieve interoperability among the formats via the conceptual model defined in IEEE Std 1484.13.1-2012. New IEEE Standard - Active. Specified in this recommended practice is how the elements and attributes defined in the IMS Content Packaging Information Model (CP) Version 1.2 relate to the components of the conceptual model for resource aggregation defined in IEEE Std 1484.13.1¿¿¿-2012.